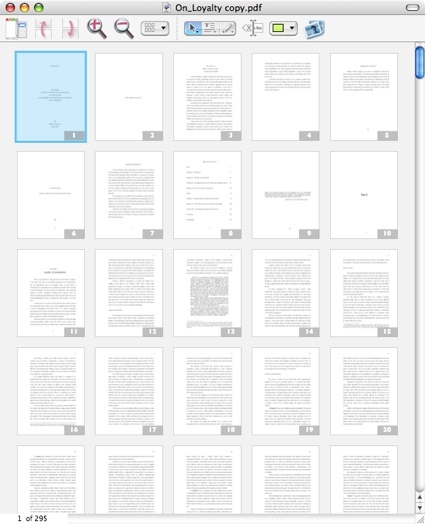 In my professional life I deal with a lot of PDFs. In my research I'm constantly reading PDF versions of journal articles, and often I'm submitting articles of my own in PDF (though a distressing number of journals require Microsoft Word DOC submissions). I also often convert my students' papers to PDF for commenting, etc. All of this is to say, I'm always on the lookout for good tools to help me deal with PDFs. Of course the 900 pound gorilla of PDF tools is Adobe Acrobat ; unfortunately, it's priced accordingly (Acrobat Professional is $379.99 at Amazon). So I thought I would look at two much less expensive PDF tools on the Mac, to see how they stack up, and to decide which one I want to spend my own hard earned cash on. Our two candidates are PDFClerk (€30 or $40.50) from SintraWorks and PDFpen ($49.95 or $94.95 for Pro edition, educational pricing available) from SmileOnMyMac. Let's see how they compare. As you can see above the main interface of PDFpen more or less consists of the PDF itself plus the tool bar. There's also a slide-out drawer that gives access to search, a table of contents if on exists, and a summary of comments (if any). 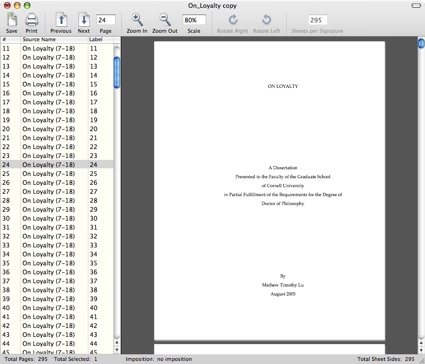 Unlike Preview, the drawer does not show page thumbnails, because the main interface itself can be switched to Document view, which will generate thumbnails of the entire document as below. In document view, you can select and re-arrange pages by drag and drop as well as delete pages. In this respect it works exactly as you would expect. You can move one or more pages around, delete entire sections of pages, etc. These operations look very slick as you're working directly with thumbnails of your pages, that makes it easier to see exactly which pages, especially as you can zoom in and out. The pages are numbered in the bottom right hand corner so you can clearly see the ordering as you change pages about. Unfortunately, with large documents, PDFpen can become unresponsive and even lock up in Document view. While I had no problems with PDFpen when testing with shorter documents (<50 pages), when I threw my old ~300 page PhD dissertation (the only long PDF I had) into it, it repeatedly froze up with the spinning beachball of death when I selected Print and had to be Force Quit. In addition to Document view, there's also also Single or Facing Page view. 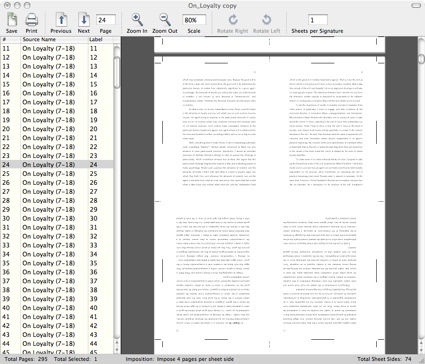 In Single Page view you gain access to PDFpen's editing tools. It's here that PDFpen really shines. There's a Note tool that allows you to leave notes anywhere on the page, placing a small speech bubble icon on the page, with the note text itself in a small pop-up windows. This allows much longer notes than would be possible if you were directly placing text onto the page itself. Furthermore, these are standard PDF notes which can be viewed in both Adobe Acrobat Reader and OS X's built-in Preview application. These notes are thus perfect for commenting on papers, especially when combined with PDFpen's highlighters, which let you select text and highlight it in one of four colors. As well as the Note tool, there's both a "Comment" tool and a "Text Imprint" that each allow you to place text directly on the document in editable and resizable boxes over the PDF content. There is, of course, a "Graphic Imprint" tool as well that allows you to place images on the document. Obviously both of these imprint tools are very handy for filling out scanned forms, including signing the form with a graphic image of your signature (which you can just drag and drop from the Finder). Finally, there are some simple line drawing tools that allow you to imprint various shapes. Maybe best of all, PDFpen also has an extremely useful Correction tool. If you are working on a document with selectable text, you can select the text and hit this the correction button to generate a text imprint with the same content as the selected text, in a closely matching font. This lets you easily make changes in the text itself to correct typos, etc. I think it is these page editing tools where PDFpen is strongest, offering the more flexibility for single page editing. The Notes feature is particularly welcome, because the free Adobe Reader will not let you place Notes or Comments on a PDF unless commenting has been enabled in the security settings, which requires either Acrobat Standard or Professional. So if you generate PDFs using OS X's built-in Print to PDF features you will not be able to markup that PDF using Adobe Reader, but you will be able to do so with PDFpen. In addition to all the regular features of PDFpen the pro version, for $94.95, brings with it the ability to create fillable forms. Fillable forms are not like scanned forms, but have actual editable text fields that can be filled in with Preview or Adobe Reader. In this sense they are more like forms on a web browser. The advantage of such forms is obvious; your customers/clients, etc. can fill them out with free software and not have to use Text Imprints. The most obvious competitor to PDFpen is SintraWorks's PDFClerk. As you can see, the main interface of PDFClerk includes a Source List. This makes PDFClerk less visually attractive than PDFpen, but I also think it makes it more responsive in large documents than PDFpen in Document view (presumably because it's not having to generate hundreds of thumbnails). As with PDFpen in Document view, you can select, re-arrange, and delete pages, by drag and drop using the list rather than thumbnails. In many ways, PDFClerk seems much more at home dealing with a document as a whole rather than a single page but that's not to say you can't do edits on a given page. 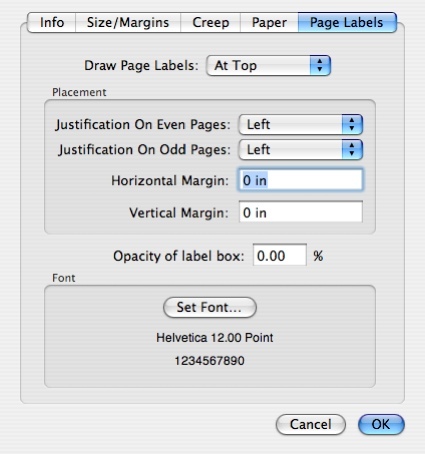 For instance, as with PDFpen's "Text Imprint" it's easy to fill out a scanned form using "Text boxes". These text boxes have transparent backgrounds, allowing you easily to place text on the page, with a simple right click. And like PDFpen you can also place images (e.g. a signature) on the page by drag and drop from the Finder. Finally, you can also draw simple shapes on the page as well. Where PDFClerk really shines though is in editing large sections of the document, rather than single pages. PDFClerk allows a great deal of flexibility in "Impositions," which is to say, how the PDF pages are actually laid out on the printed sheet of paper. So it's quite easy, for instance, to print many pages on a single sheet, and even order those pages on the printed sheet so that when you print it, it can be folded into a booklet, etc. Here you can see a four page Imposition (i.e. print four pages on one sheet of paper, along with layout marks). One very nice feature that PDFpen apparently lacks is using imprints to re-number pages. For instance, say you want to take out a section of a long PDF document, but when you do so the page number are all messed up. With PDFClerk you can automatically generate a "Page Label" that will appear over the page numbers, thus keeping the page numbers consistent when you print the new document. These Page Labels have to be placed on the document by specifying their Horizontal and Vertical orientation, and so sometimes it takes a little bit of trial and error to get it perfect, but it's generally not too hard. Overall, both of the applications do what they're supposed to do. Each allows you to fill in and sign scanned forms, re-arrange and delete pages, and add in graphics and text. However, I think it's safe to say that they have different strengths. PDFpen is stronger at single page editing, particularly with support for markup and Text Imprint Corrections. If you want to markup a specific page (as I do when grading papers), PDFpen has a richer selection of features. On the other hand, PDFClerk has more features for dealing with a document as a whole. In particular, its Page Label (i.e. page renumbering) feature is quite handy. It also seems to be more versatile with regards to Imposition options (i.e. the actual printing of the PDF content to paper). Furthermore, PDFClerk is much more responsive with large documents, presumably because it does not have to deal with so many thumbnails. So as far as which one to buy, I don't think there's a clear cut answer. As I said before, both programs work quite well for the basics of filling in scanned forms and reordering or deleting pages from a PDF. However, if you work with documents more on a page by page basis (e.g. 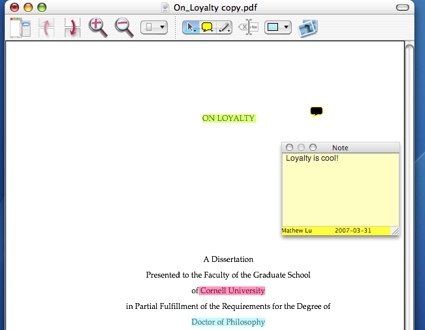 in marking up or commenting papers) then PDFpen has the edge. On the other hand, if you work more with long documents, doing Document level edits (e.g. removing whole sections and renumbering all the subsequent pages), or if you want a very flexible Imposition system, then PDFClerk has the edge. Pros: Good page level markup tools, especially the Text Imprint Correction Tool, allows Notes on PDFs that Adobe Reader will not allow you to markup, looks good, Professional version allows creating fillable forms. Cons: non-responsive on long documents, lacks some of PDFClerk's Imposition and Page Labeling features, Professional version costs $95. Pros: Very responsive even with long documents, very flexible Imposition features, Page Labels. 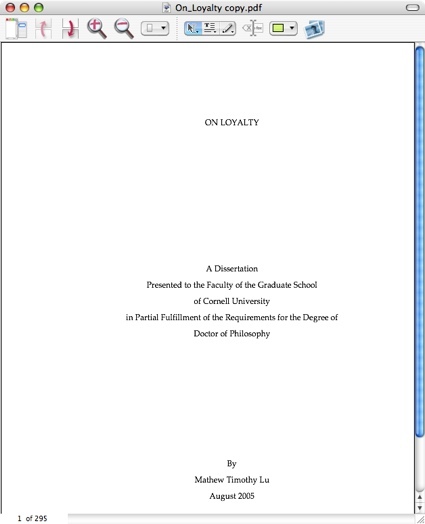 Cons: lacking in page markup tools, not as visually attractive as PDFpen.